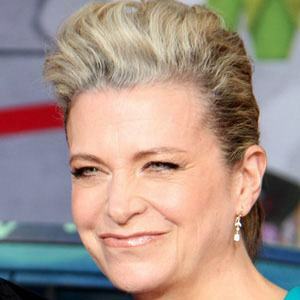 The English author of four bestselling novels, including Getting Rid of Matthew (2007) and Got You Back (2008), she is also the longtime girlfriend of Ricky Gervais. Also a television producer, she worked on such shows as EastEnders and Undercover Heart. She met Gervais at University College London in 1982. She began working on EastEnders three years later. Her novels have been translated into nearly two dozen languages. She grew up in London's Harrow neighborhood. She and Ricky Gervais began living together in 1984. Adam Woodyatt starred on the BBC soap opera, EastEnders, which Fallon produced.